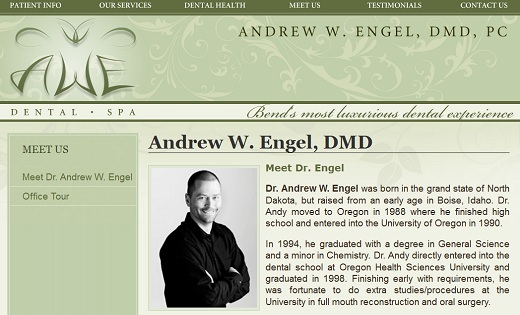 An Oregon dentist, Andrew Engel, DMD, has been ordered to pay a former employee (dental assistant) over pressuring her to attend a Scientology seminar. State labor officials have ordered a dentist to pay nearly $348,000 to settle allegations that he threatened to fire a dental assistant unless she attended a Scientology-related training session. The Bureau of Labor and Industries contends Dr. Andrew W. Engel repeatedly “badgered” Susan Muhleman about the three-day conference despite her concerns that it would conflict with her Christian beliefs. He also turned down her request to attend secular training instead, investigators said. As a result, Muhleman quit AWE Dental Spa in August 2009 — weeks before the conference — and moved out of state to find a job, the state agency said. Muhleman said she was opposed to going to the Scientology conference but worried about losing her job at the height of the recession, when the local jobless rate was about 15 percent. She was the only person in her family employed full time, she said. “It weighed very heavy on me to have to make a decision like that for the future of my family,” she said. Muhleman filed a complaint with BOLI’s civil rights division in November 2009, launching the investigation. Religious discrimination cases are relatively rare, comprising just 3 percent of the agency’s annual workload. There is more detail on the story here, including the order of Bureau of Labor and Industries for the State of Oregon. What was this dentist thinking? Religion and the workplace do not mix and this is another example. Dental office seminars are great, but forcing an employee to attend is always a mistake and Engel should have known better.